Historical literature often suggests that Japanese people hold harmony and group solidarity in high regard. Tokugawa-period agreements, or what I call Bonds of Trust (tanomi shōmon), shed light on the mechanisms and guiding principles that buttress social cohesion in early modern Japan. The Bonds of Trust were written promises primarily used to elicit and sustain cooperation within a group of Tokugawa peasants when they stood in resistance to their competing groups and samurai feudal rule. Divine oaths (kishōmon) traditionally served that role by using the threat of divine punishment as a deterrent to defection. The Bonds of Trust pose a perplexing problem, however, for those who view belief in omnipotent gods as an ideal, cost-free system for maintaining cooperation. The historical significance (and the puzzle) of the Bonds thus lies in the demonstration of the ability of Tokugawa Japanese to act for the benefit of others in the absence of both divine as well as aristocratic intervention. Focusing on properties characteristic of both kishōmon and tanomi shōmon, this talk provides a plausible theoretical explanation for the basis of Tokugawa altruism and cooperation. The speaker is a PhD candidate in the Department of Asian Studies, who is currently working on her dissertation on the social history of early modern Japan. She joined the program after completing her M.A. in History at the National University of Singapore. 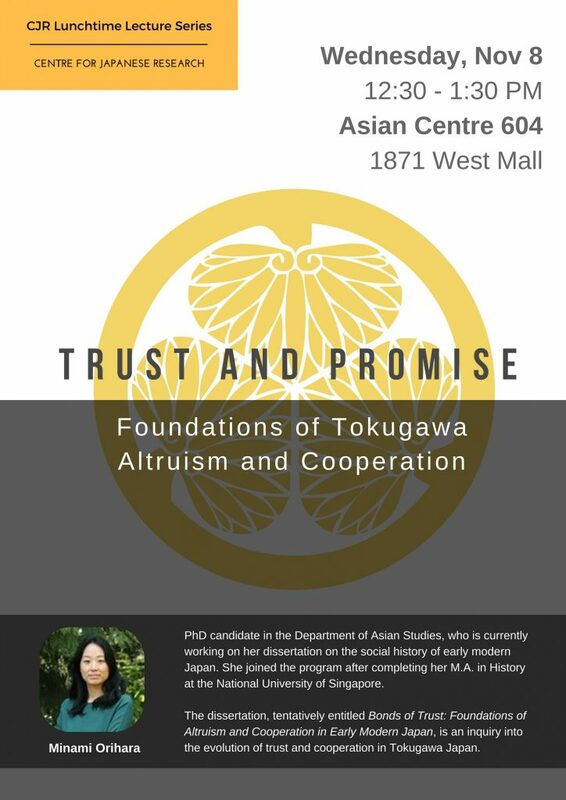 The dissertation, tentatively entitled Bonds of Trust: Foundations of Altruism and Cooperation in Early Modern Japan, is an inquiry into the evolution of trust and cooperation in Tokugawa Japan.